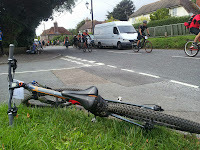 On Saturday I took part in the London to Brighton off road bike ride. 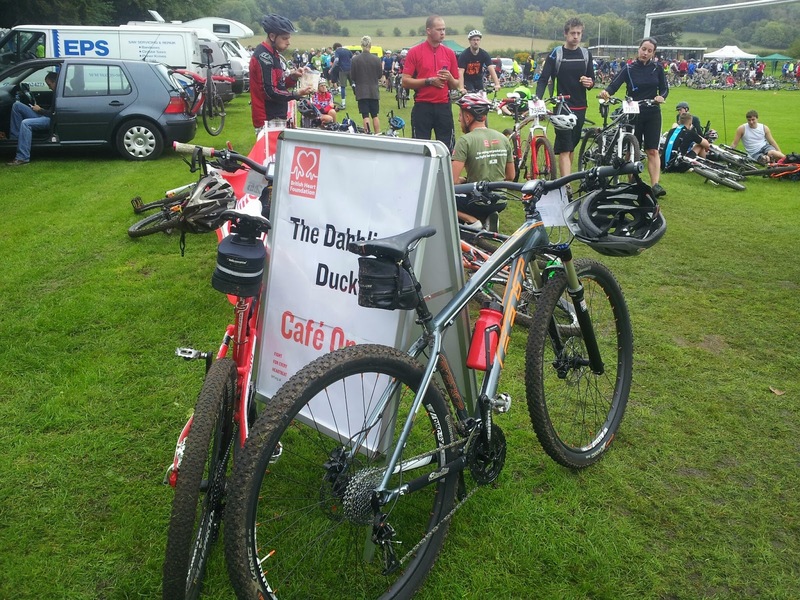 The event, now in its 6th year attracts around 3,000 mountain bikers who take to the cycle paths and single track trails to ride all the way to Brighton from the capital to raise vital funds for the British Heart Foundation. I took part in this event last year and found it tough going. However, I wanted to complete the L2B triple and do the day, night and off-road ride in the same year. The ride starts at Roehampton University and heads west through Richmond Park, along the River Thames to Hampton Court Palace and then to Weybridge in Surrey before heading south. As the ride heads over the M25 and the A3, you ride straight through Wisley airfield. It's a runway dating back to WWII and it feels quite strange riding through it. The ride was the same route as last year and was to head through the small village of Shere. The village was also host to the Tour of Britain on the same day and the road would close at 1 pm to allow the race to pass through. Fortunately I arrived in the village just over an hour before, so wasn't held up. It wouldn't have been a bad thing if I had been but it would have meant a longer day. The route wasn't as dry as last year. We were spoiled by such good conditions in 2012 that anything else would be slower. The course was a little tricky in places but nothing serious. 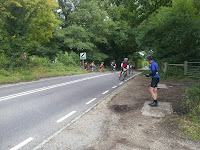 The longest and most tedious section of the route is the Downs Link. It's an old railway line and connects Guildford with Shoreham-by-sea. The entire length of the Downs Link is 37 miles. The route took us on 26 miles of it. The Downs Link was also the place where I had my crash. While crossing the road and bumping over some kerb stones, the angle I hit them and with mud on my tyres, my front wheel slid out from under me and I hit the ground hard. With a grazed knee and a bruised hand I wasn't badly injured. Within minutes however, two other riders did the same. The place where I fell off. There's three proper hills on the ride with the most severe being at the end. The Bostal climb to Southwick is pretty tough. It's quite rutted and has a rainwater channel carved out of it. Not being very wide there's not much room to find the best line whilst others are walking their bikes up it. Last year I got up it in one go without walking. This year wasn't quite as good. I did get up without walking but did have to put a foot down twice. The surface was a little crumbly. Once you've done the climb there's a longer steady ascent to Truleigh Hill. At the top, there is a fast and bumpy descent into Shoreham. Last year my wrists and arms took a battering from the cheap suspension forks on my bike. This year, with a new 29er with air suspension, was much better. Once in Shoreham you cross the harbour and head to the seafront. Last year there was a headwind to the finish. The last 3 miles felt like 3 times that. This year it was a breeze with a tailwind. In terms of difficulty, the ride was tough on the legs but that's what 73.5 miles does to you when riding on 80% off-road. 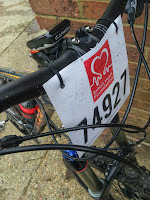 I think I must be fitter than last year as I didn't feel as tired during or after the ride. Having done it two years in a row, I'm not in a hurry to do it again. 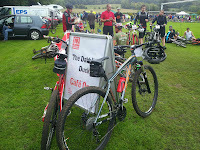 Next years challenge is the South Downs Way 100. It hurts just thinking about that one! If you want to sponsor me for my efforts, please visit www.justgiving.com/toby2013 or text 'TOBY82 £2' to 70070. Here's a video of last year's ride to show you what it's like. Crikey! Having completed the London to Brighton road ride for the first time this year, I can't begin to imagine doing that distance off-road! Well done and I hope you are properly recovered from your fall. Thank you. I am recovered. Hand is good, Hip feels a little bruised and I have a grazed knee and ankle but nothing that will stop me riding. Well done on getting the three. I missed the night ride. Heard it was a good one. Managed all the hills this time round. Foot down on the last big one. You're right about the headwind on the final straight last year. This time round it was a breeze (from behind as you pointed out). We started about 9.15am and finished around 7ish. Three of us. The pace was set by the slowest. I enjoyed the relaxed atmosphere and leisurely pace. It was foggy up on the downs and dark by the time we got to Shoreham. The going was soft to use a horse riding term. More of a slog than last year. Bang on about the tedious Downs Link. Rode the course for a second year running on my cyclocross bike - zero suspension, 28mm tires pumped to 100psi. Twenty odd miles of stony bumpy surface. It rattled my bones! 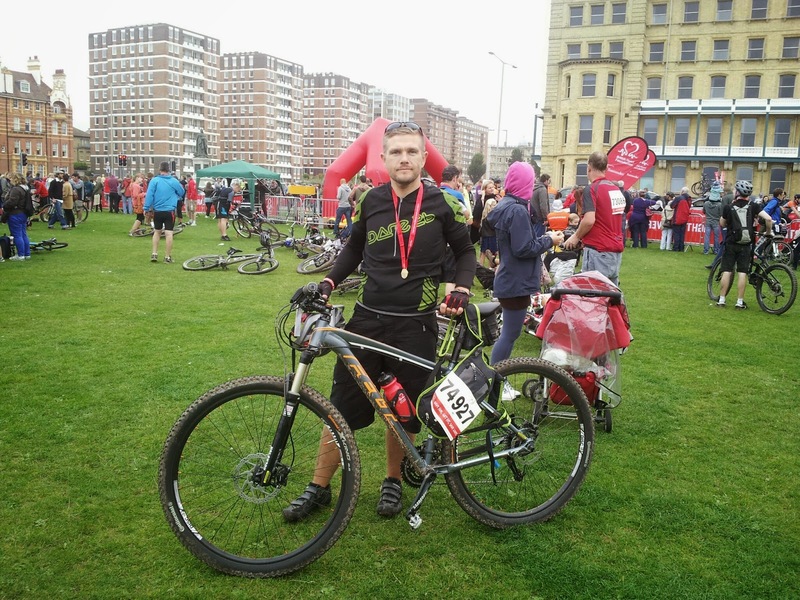 I did my first London to Brighton this year, and Toby total respect to you, with the whole series, well done. Alex, thanks for sharing your experience of the day. Not sure I'd want to do it on a CX bike with 100psi in the tyres. I don't think I'd want to do it in the dark wither. Lisa, well done on doing the London to Brighton and thanks for your kind comments.